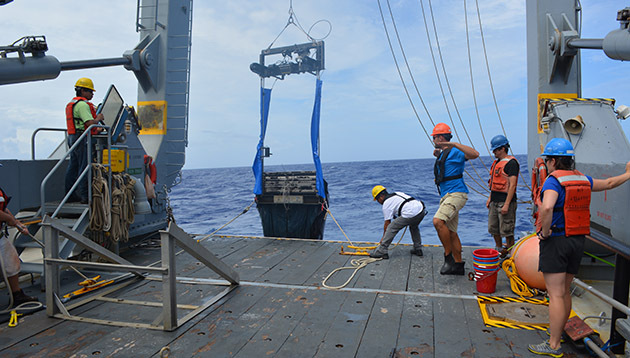 Students have the opportunity to particpate in a research cruise on board the UNOLS research vessel Atlantic Explorer as part of the Modern Observational Oceanography course. Students on the Coral Reef Ecology course learn commonly used techniques to study benthic community structure at several reef types. 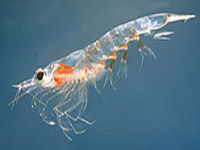 Scientists and Atlantic Explorer crew deploy specialized zooplankton nets, called a MOCNESS. 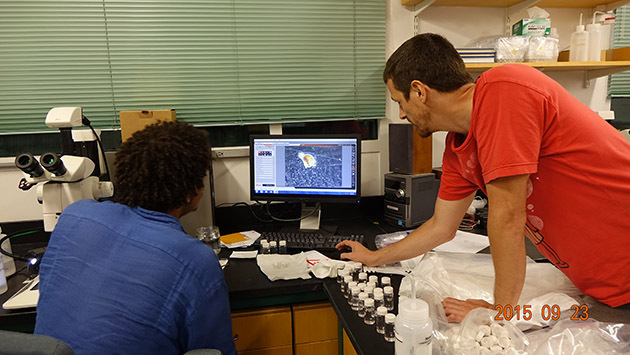 Students on the Marine Plankton Ecology course learn how the small swimming animals that are collected produce dissolved organic matter and influence microbial communities. Photo by Nick Mathews. 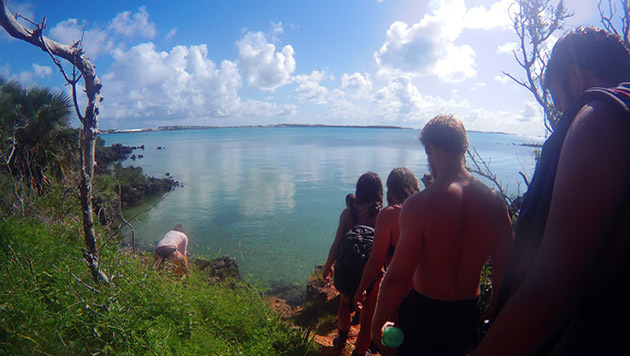 Students take a field trip to explore Bermuda's cave systems around Castle Harbour and Blue Hole Park. 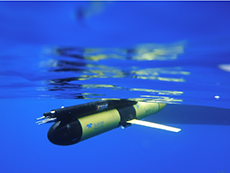 Modern Observational Oceanography students gain hands-on experience of a glider deployment five miles off shore Bermuda. 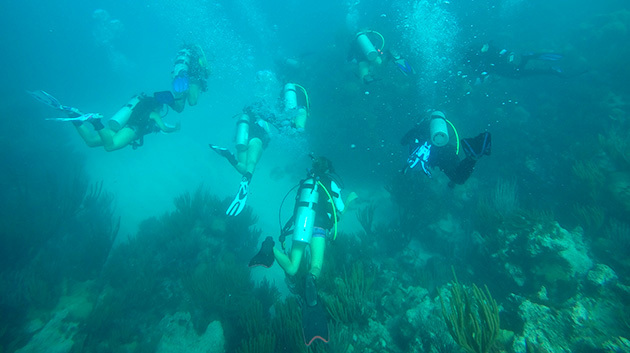 Students on the Coral Reef Ecology course perform video surveys, fish counts and macroalgae collections. Along with associated lab work, students study the benthic community structure of reefs in Bermuda. 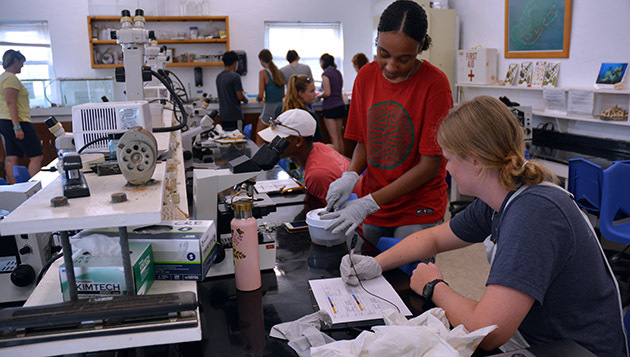 Students on the Coral Reef Ecology course separate coral tissue from the skeleton to assess physiological changes during laboratory experiments. Marine Plankton Ecology students examine taxonomy, functional diversity and the roles that plankton play in marine food webs. Summer course lectures, tutorials and workshops take place in designated lecture rooms at BIOS. On the Marine Plankton Ecology course, students can learn about a ZooSCAN instrument that analyzes zooplankton caught in a MOCNESS net. The application deadline for summer courses has been extended to April 30. 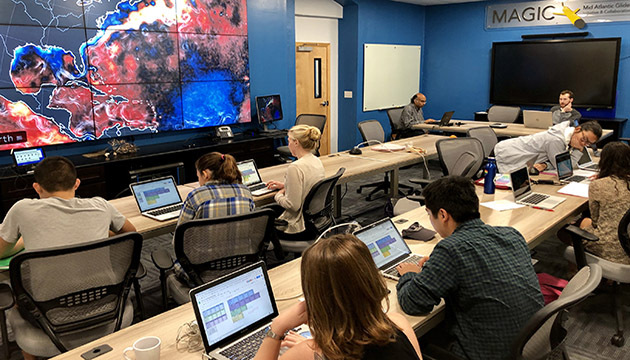 Each summer, BIOS offers a suite of courses for both undergraduate and graduate students that capitalizes upon the expertise of our faculty and visiting scientists. These courses, listed below, provide many students the opportunity to study topics in marine science that might not be offered within the curricula of their home institutions. Each course comprises lectures, laboratory exercises, and complementary field components that build upon what is learned in the classroom. Partial scholarships may be available to all students. The aim of this course is to study the biology and ecology of tropical corals and explore their response to environmental changes including those from projected global climate scenarios. This course covers the biological, physical, biogeochemical and evolutionary processes that determine reef growth, function and resilience, ranging from the organism to whole reef tracts. Topics include the processes of metabolism and calcification at the cellular, organismal, and community scale; biodiversity, determinants of community structure, examining trophic dynamics and species interactions; and reef resilience and acclimatization to environmental change, emphasizing processes of reproduction, recruitment, symbiosis and genomics. Lectures will be complemented with field and laboratory exercises. 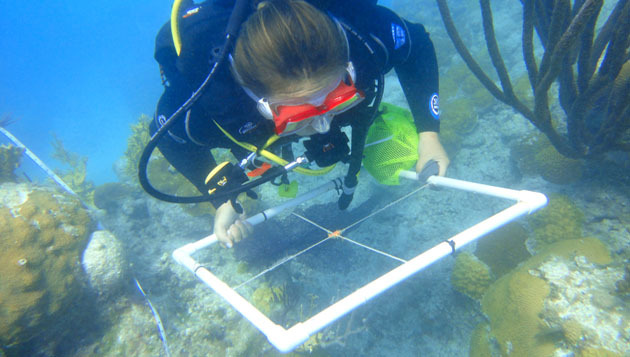 Students will gain experience in coral reef research methods and monitoring of reef health, including benthic surveys, water quality analysis, assessing recruitment recovery, monitoring bleaching, disease, reef fish ecology and invasive species. 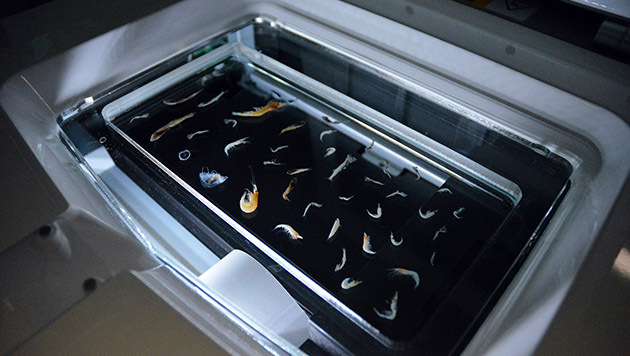 Laboratory experiments will focus on coral physiology, including respiration, symbiosis and photosynthesis, growth, reproduction and larval settlement. 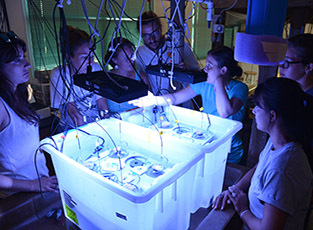 The Coral Reef Ecology course at the Bermuda Institute of Ocean Sciences is an intensive, integrated program aimed at upper level undergraduates, graduates and professionals, comprised of lectures, precepts, laboratory exercises, field (SCUBA) surveys and readings from the primary literature with attention given to active areas of research. The course culminates with a morning of oral presentations where the students present their analysis and research on the data sets collected during the field and lab work. More information and an example schedule can be found here. Prerequisites include satisfactory standing in university-level biology and ecology, and SCUBA certification. Course fee: $4,900 (tuition, room and board). Students can apply to BIOS for scholarships to assist with the course fee. 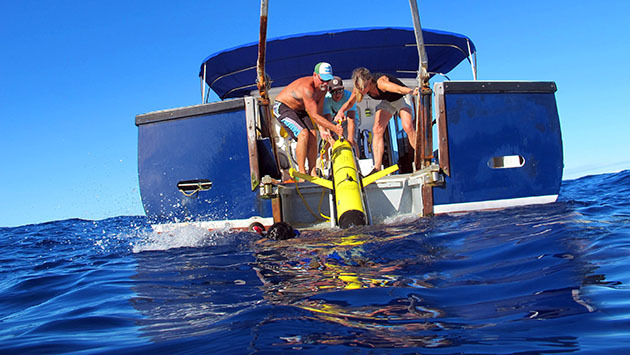 Modern oceanography combines increasingly large and diverse datasets to further our understanding of biogeochemical and physical processes in the marine environment. How are these data obtained and used? The aim of this course is to provide students with a broad introduction to and practical experience in the field of observational oceanography utilizing a variety of state-of-the-art technologies and methods. During the 3-week course, a combination of lectures, laboratory training and fieldwork will introduce students to current research questions and observational methods used to investigate them. Themes will include carbon and nutrient cycling and the processes that affect biological production in the ocean, carbonate chemistry and ocean acidification, ocean-atmosphere interactions, and the spatial/temporal scales of physical ocean processes. 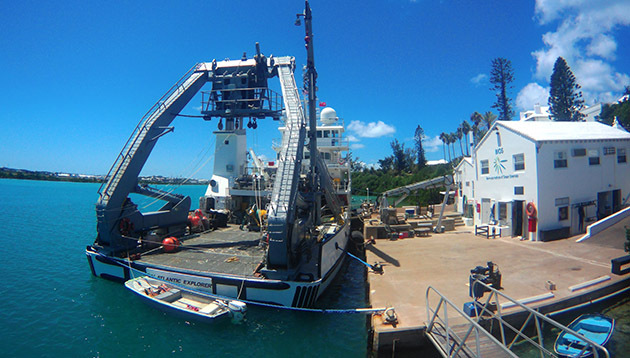 Students will collect samples and utilize various sensors and instrumentation – locally at the BIOS dock, on a research cruise aboard the UNOLS vessel R/V Atlantic Explorer, and through a small fleet of autonomous underwater vehicles (AUVs) deployed offshore of Bermuda – to develop a practical understanding of both the science topics and the techniques used to study them. Throughout the course, students will conduct experiments, participate in round-table discussions, give presentations and produce a short report – all of which will provide opportunities for hands-on learning and a basis for evaluating student progress and performance. This course is open to undergraduate and postgraduate students enrolled in oceanography programs. Adequate standing in university-level physics and chemistry courses is required. SCUBA certification is not required. Course fee: $4,900 (tuition, room and board). Students can apply to BIOS for scholarships to assist with the course fee. More information and an example schedule can be found here. Marine plankton are essential components of marine food webs and are comprised of a vast diversity of organisms – from prokaryotic unicellular organisms to bioluminescent gelatinous jellies. This course will examine taxonomy, functional diversity and the roles that plankton play in marine food webs, from onshore habitats (i.e. coral reef) to the open ocean (Sargasso Sea). Students will gain hands-on experience sampling a broad range of plankton types during boat and shore-based excursions, apply modern optical, molecular and physiological tools and traditional microscopy all while honing their observational techniques. Lectures and laboratories will cover a broad range of relevant topics and ecological principles in plankton ecology. More information can be found here. This course is for upper level undergraduate and graduate students. Prerequisites include moderate to advanced swimming ability and satisfactory standing in marine ecology courses. Course fee: $4,900 (includes tuition, room and board). Students can apply to BIOS for scholarships to assist with the course fee. The Summer Course Application Form, along with complete instructions, can be found here. Please download the form to your computer (e.g., save it to your desktop), complete it, save it, and send it along with all supporting documents as listed on the application to education@bios.edu by April 30 in order to receive full consideration. Letters of reference should be sent directly to the BIOS education email by referees. Late applications will be considered until the courses are full. Forms filled out in browser mode (i.e., in preview) may not save appropriately. Partial scholarships are available for summer course fees. We do not award scholarships toward travel costs. To apply for a scholarship please fill out the appropriate section at the end of the application form and submit a statement of need along with the core application documents. All students accepted into a BIOS summer course are eligible to receive a partial scholarship from BIOS scholarship funding. Information on summer course scholarships, generally, as well as eligibility for specific scholarships, can be found on the scholarships page. Dalhousie students may apply for scholarships to attend BIOS summer courses through the Dalhousie-BIOS Experiential Learning Fund; please refer to the Dalhousie-BIOS Application for Undergraduate Scholarships for the deadline, more information and how to apply. Please read the Course Payment Schedule & Refund Policy, as well as the note about Course Dates and Academic Credit before making your travel plans. Foreign nationals traveling to Bermuda do not require an entry visa. However, proof of residency or a valid Multi Re-Entry Visa for the U.S.A., U.K., or Canada may be required for non-U.S./U.K./Canadian citizens, depending upon your country of origin. Please review Immigration Information to check the Bermuda Department of Immigration requests. Please note that BIOS may cancel a summer course if there is insufficient enrollment.